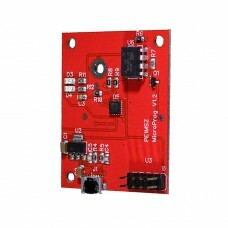 MicroProg is a tiny board, equal in size as the BlueStack-Micro range. ​- Use MMDVM-host on your PC, and use the unit as a dongle for DMR, and Dstar, Fusion and all other protocolls in MMDVM! - Ser2net with a raspberry pi can be done as well. Note: no Bluetooth functionality, similar as in the micro+ the firmware exits programming-mode after 1 minute. (if you start programming in the first minute, upgrading will be just fine). Unit does fit the BlueBox-range, LED's are visible through the ligh-guides.